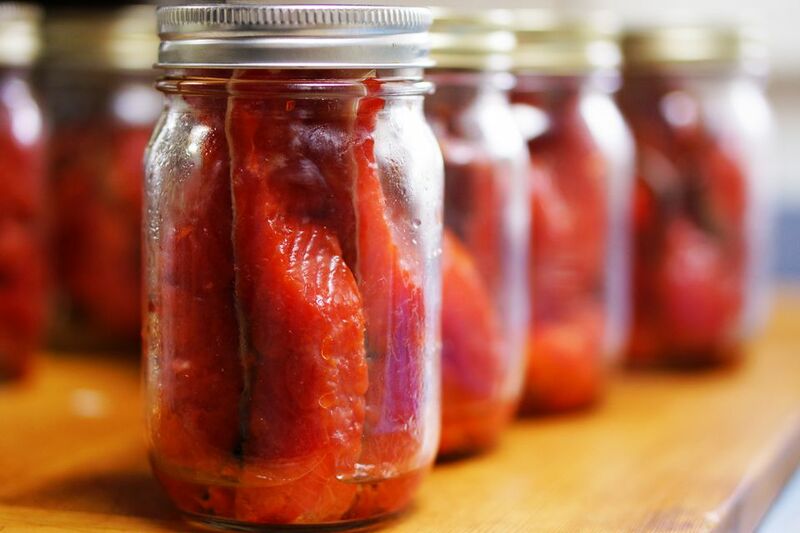 One of the best ways to preserve fresh produce for use year round is canning. The process has been around for hundreds of years and you can’t beat it for saving money and ensuring your family is getting good quality, healthy food regardless of the season without using unnecessary chemical preservatives. While many home canning recipes are fine for water bath canning, any non-acidic food you want to preserve should be canned using a pressure canner to kill any possible bacteria with the high heat used in pressure canning. Tomatoes, most fresh fruit, pickled vegetables, salsas, chutneys (unless the recipe indicates otherwise), fruit jams, and fruit jellies are all acceptable for water bath canning. All fresh vegetables are low acid foods and require pressure canning. Other examples are red meat, poultry, seafood, and any milk products. If you mix low and high acid foods, you should still can them as low acid unless the recipe calls for enough citric acid, lemon juice, or vinegar to change the pH to a high acid food. There are two types of pressure canning equipment. Dial gauge canners show a range from 5 to 25 psi (the better choice if you live at higher altitudes). Weighted gauge canners show pressure in 5 pound psi increments. Make sure the pressure canner you buy has Underwriter’s Laboratory (UL) approval. A new pressure canner can cost anywhere from $70 to several hundred dollars depending on the size and type you choose. Some pressure canners have gaskets that can crack or stretch and they will need to be replaced. That is another cost to figure into your decision when buying a good pressure canner. The good news is the really good pressure canners will last for years if maintained properly. You can buy used canners but if you do, take them to your local extension office or a hardware store to have the gauges checked for accuracy before you use it the first time and again at the beginning of each canning season. You also want to make sure all the gaskets are in good working order and not cracked and the lid locks securely before you start using it. Once you know your pressure canner is in tip top shape, you’re ready to start canning. When selecting your recipes, make sure they include instructions for the length of time, PSI required, the amount of space to leave at the top of the jars, and how much the recipe should yield. Making sure you have a clean workspace, prepare your recipe according to the directions and fill the jars. Make sure you leave the recommended amount of space at the top of the jar between the food and the lid. Remove any air bubbles by sliding the plastic knife around the inside of the jar. Clean the rim of the jar, put the lid on, and twist until tight. Do not overtighten the lid. Place the jars in the canner and add 2 or 3 inches of water (unless your canner advises differently) and secure and lock the lid. If you’re using a weighted gauge canner, remove the weight. If you’re using a dial gauge, remove the petcock. Heat the canner over high heat until steam is escaping. Allow the steam to vent for about 10 minutes. Reattach the weight or the petcock and bring the canner to the recommended pressure for your recipe. When you reach the proper pressure, set a timer and keep an eye on your canner to make sure you are adjusting the heat as needed to maintain the pressure at the lowest possible temperature. Remove the canner from the heat when time is up according to your recipe. Set the canner aside and let it cool 30 to 45 minutes. Remove the weight or the petcock and let the canner stand for another 15 minutes. Then remove the lid – be careful to avoid steam burns. Let the canner sit without the lid for another 10 minutes. Remove the jars and let them cool, leaving enough room between the jars to allow air to circulate. Let the jars cool for about 24 hours then check the lids to ensure a good seal. Press firmly in the center of the lid. If they don’t give, you have a good seal. If they do, you don’t have a good seal and you need to repeat the process. Fill out your labels with the contents and the date you canned it and place them on your jars. Your pressure canned goods should last about 12 months. However, if you open a jar that doesn’t look quite right, don’t smell it or taste it. Just throw it away. Boiling the contents won’t kill the type of bacteria that could be living inside and it can make you seriously ill. Err on the safe side and toss it. Few things can compare to the joy of having home canned goods from the spring garden in the middle of the winter and knowing you canned them in your own kitchen is even sweeter. It's a wonderful feeling to feed yourself, and your family, such a healthy bounty. Set aside a weekend and you can stock your pantry for the year.